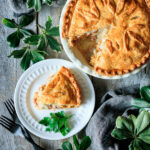 Cheesy ham and potato pie is a simple comfort food recipe for families. Use up leftover ham from Easter, Thanksgiving, or Christmas in this tasty savory pie. Layers of juicy ham, cheese sauce, sliced potatoes, garlic, and scallions are baked under an ultra-flaky cheese crust. How can you say no? Grate the cheddar cheese and set aside. Pour the flour and salt into a medium mixing bowl. Add the butter and lard and rub in the fats until the mixture resembles large breadcrumbs. Mix in the grated cheese and add 2 tablespoons of cold water. Stir the mixture with your hand until it comes together as a dough. If the mixture seems dry, gradually add more water a few drops at a time until all the flour is picked up and a smooth dough has formed. Turn the pastry onto a clean work surface that hasn’t been floured and knead gently a few times to finish combining the ingredients. Shape the pastry into a flat disc and wrap tightly in plastic wrap. Let the dough chill while you prepare the filling (about 1 hour). While the pastry is chilling, roughly chop the smoked ham into bite-sized pieces and set aside. Peel and thinly slice the potatoes, then put them in a medium pot and cover with cold water. Bring to a boil and let the potatoes cook for 3-5 minutes, until fork tender. Immediately drain the potatoes and set aside. Slice the spring onion and mince the garlic. Melt the butter in a small frying pan over medium heat until bubbling, then add the onion. Fry until the onion has softened some, then add the garlic and cook until fragrant. Spoon the mixture into a small bowl and set aside. Measure out the butter, flour, and milk, and grate the cheese for the sauce before starting. Melt the butter until bubbling in a 2-quart saucepan set over medium heat. Add the flour and whisk constantly until the roux has turned light brown and smells toasty. Pour in a little of the milk and whisk until combined, then whisk in the remaining milk. Stir the sauce constantly over medium heat until it has thickened considerably. If the sauce is extremely thick, add more milk to thin it a little. Whisk in the grated cheese until it has fully melted and is well mixed in to the sauce. Add the white pepper, salt, and smoked paprika and stir to combine. Keep the sauce on low heat until needed, stirring occasionally to break the skin that will form on the surface. Preheat the oven to 400 F and put a large rimmed cookie sheet in the oven to preheat. Roll out the chilled pastry on a lightly floured surface to a little less than 1/8 inch thick (about 3mm). Use it to line a 9-inch, deep dish pie plate, then trim off the excess with a sharp knife. Spread half of the sliced potatoes in the pie plate, then top it with half of the ham and all of the scallion/garlic mixture. Spread all of the cheese sauce evenly over top, then layer the remaining ham and potatoes on top. Beat the egg in a small bowl until blended, then brush the edge of the pie with the egg. Re-roll the remaining pastry and use it to cover the the pie. Gently press down along the edges to seal the pastry together, then trim off the excess with a sharp knife. Pinch the edges to decoratively crimp the pastry. Cut out a few small leaves as decorations and use the knife to draw veins on each leaf. Brush the whole pie with beaten egg and stick on the leaves as desired, then paint more egg on each leaf. Cut a few vent holes in the top. Bake the pie on the preheated cookie sheet at 400 F for 35-40 minutes, until well browned. Let the pie cool for at least 15 minutes before slicing and serving.